The Platoniq team is very excited because we have started working in an area that we love but that we still did not have the opportunity to delve in depth in: democratic participation. We have also started working with an unbeatable partner, Decide Madrid, the participation project of the Madrid City Council, which is also behind the development of Consul - with replicas in more than 30 cities around the world. 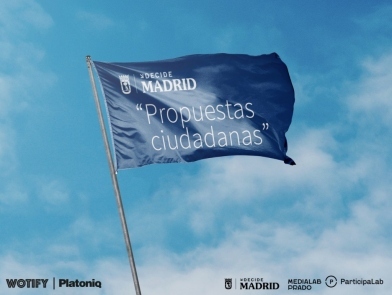 The goal of our work is to provide the experience of Platoniq in co-creation methodologies and collective financing processes in order to devise improvements in one of the specific tools of Decide Madrid: the citizen proposals. That is the space where Madrid residents can make specific proposals -from public policy proposals to suggesting concrete improvements in a neighborhood. It the proposal receive the necessary support, they will be carried forward by the local administration. That is the commitment of the City Council, and so far, only two proposals have achieved this objective. Therefore, in partnership with ParticipaLab (the Laboratory of Collective Intelligence for the Democratic Participation of MediaLab Prado), we have begun to devise two pilots that suggest improvements in the different phases of the proposals. The first activity we have engaged in, carried out on the 12th December, has been a workshop with experts in participation and digital platforms. During the workshop, we have analysed the lifecycle of a proposal and have proposed new phases to promote its success. We have also worked together with participants to identify potential users and their motivations to engage in the different phases of a citizen proposal. We have created possible scenarios to develop and have validated them through collaboration with both workshop participants and ParticipaLab and Decide Madrid teams. As a result of this first activity, the team has agreed on two lines of work to be developed in the coming months. One of the directions will be the revitalization of the current community using strategic communication tools with previously segmented users,. The other direction will focus on increasing the scope of citizen proposals in areas outside the platform. These two lines will be finalized in the next workshop, on the 1st February in Medialab Prado. If you are interested in any of these two areas of work, you are warmly invited to participate! Regardless, we will keep you updated on the progress of the work we are doing to improve the reach of the Decide Madrid platform. Stay tuned!